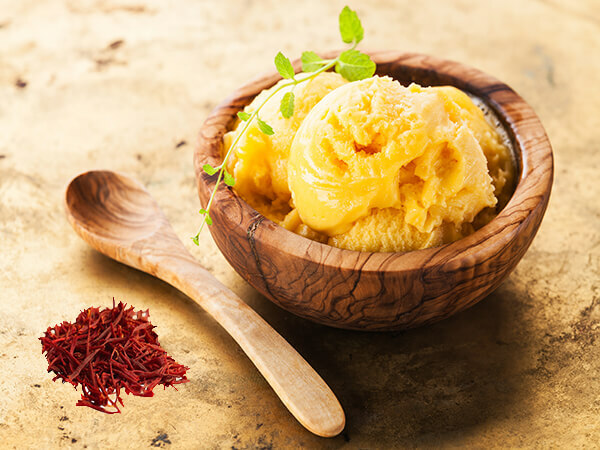 Sorbet (Xorbet) was first created by the Persians around 400 BC, well before the Italian’s claimed it as their own. Since this was a long time before freezing technology, the Persian’s had to be a bit more inventive. In an effort to cool down in the summer months, some unknown genius decided to mix mountain snow with rose, and strands of rich fragrant saffron. Soon after this, more flavours were born, including the famous sharbat, snow mixed with fruit syrup and honey, and, later, Faloodeh which was Rose Water and snow mixed with Vermicelli. We can also thank the Persian’s for thinking up the combination of pistachio and rose, which was made famous by Akbar Mashti, the first man to open an ice cream shop in Tehran, and also invent the delicious Bastani Ice Cream, a thick sticky, near glutenous textured treat. It is said that during the Roman Empire, Nero Claudius Caesar enjoyed ‘fruit ices’ so much that he frequently sent runners into the mountains for snow, which was then flavoured with real fruits. It was, in all respects, a luxury dessert. Enjoyed in the halls of the opulent royal families who had the amenities to prevent snow from melting by storing it in huge underground pits. Ice cream came to Europe (and then America) after the Arabs invaded Sicily in the 8th century. The Arabs, who had already conquered the Persian Empire, took sharbat innovating it with the use of sugar-cane and milk to create what we would now call a Gelato. Still, it wasn’t until Marco Polo arrived back from China with a slightly different recipe for iced desserts that it really stuck around in Italy and began to evolve into the dessert we know it as today.